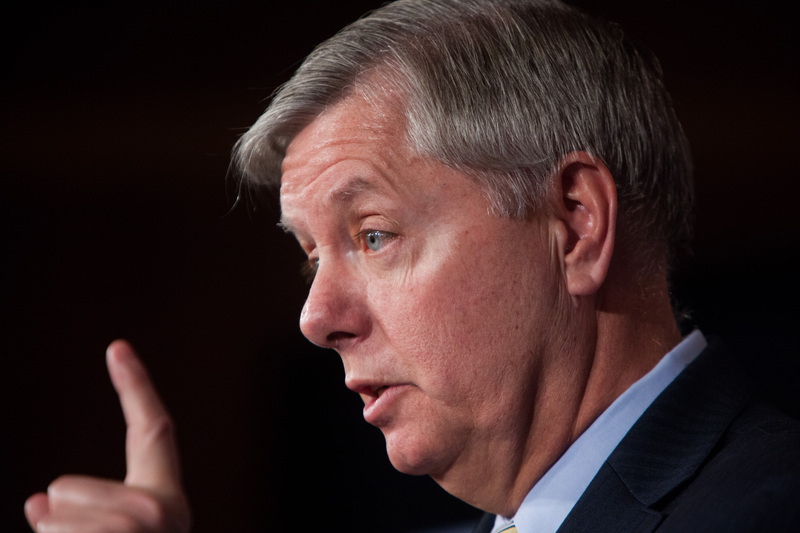 If Lindsey Graham Thinks Background Check Failures Contribute To Shootings, Why'd He Vote To Weaken Them? Wednesday's shooting in Charleston, South Carolina, offered high-profile politicians an opening to speak up about gun control. Democrats like President Obama and 2016 candidate Hillary Clinton openly discussed the importance of tight gun control throughout the rest of last week. Conservatives who support lax gun control laws were in a more difficult position. However, one Republican candidate, Lindsey Graham, expressed disappointment in the background check system Friday, apparently forgetting that he has voted to weaken background checks. Graham was, admittedly, in a tough situation — he's a senator from the state where the shootings occurred, and an opponent of most gun control regulation. However, the blame he put on the background check system makes no sense, due to his own record of purposefully weakening it. In a Friday interview with CNN, the candidate opened up about gun legislation failures and said, "I own a bunch of guns and I haven't hurt anybody. But there is something wrong with the background system." Really the last thing on my mind right now is a political debate. My job is to be here and to show solidarity with my community and my state. But if you want to have a debate, we'll have it. I don't mind debating gun control. And I want the American people to know that the solutions to problems like this are probably not one law away. According to Graham's own definition, he is part of this problem. In 1999, he voted in favor of Bill 2122, also known as the Mandatory Gun Show Background Check Act, according to the House Clerk. Had it been enacted, this law would have reduced the waiting period to buy a gun at a show from three days to one. Graham also voted against the Protection of Lawful Commerce in Arms Act of 2004, according to the Senate. The law would have required criminal background checks on all firearm transactions at gun shows where at least 75 guns are sold. Perhaps he thought that because neither of these bills became law, no one would remember that he tried to weaken the background check process. Graham has a harsh record of voting against other forms of gun control such as bans on magazines that contain more than 10 rounds of ammunition and has eased conceal-and-carry laws. He has received an A rating from the National Rifle Association, indicating that he is very pro-guns. Graham's history makes his newest gun statements seem pretty hypocritical. It's unclear whether he suddenly changed his mind on background checks, or is using the tragedy as an opportunity to appear tough on violence. Either way, something isn't right here.